As we mark World Refugee Day 2018 on June 20, governments confront humanitarian challenges of enormous proportion, with more than 68 million refugees and internally displaced persons (IDPs) around the world. The U.S. government has long played a key role in helping meet the needs of refugees and IDPs. Thus, it is appropriate and important that Refugees International (RI) evaluates and offers a report card on the Trump administration’s progress on refugee and humanitarian protection. We have evaluated the Trump administration in six critical areas involving performance both at home in the United States and overseas. Regrettably, as described in detail in the sections that follow, the Trump administration has received an overall failing grade for its policies and performance. Unfortunately, over the past 17 months, the Trump administration has significantly weakened U.S. domestic refugee law and humanitarian policy. This of course includes the inhumane separation of families seeking asylum at the southwest border of the United States. But there are many other examples of this erosion of basic protection principles, including the dramatic weakening of the U.S. political asylum process generally, the crippling of the U.S. Refugee Admissions program, and the disregard of humanitarian imperatives in the application of Temporary Protected Status. In humanitarian activities overseas, President Trump has sought to roll back U.S. leadership in financial support for lifesaving assistance based on need, imposed policies that adversely impact women and girls, and failed to assert leadership in efforts to end conflicts that continue to inflict horrific humanitarian suffering. While this is discouraging news on World Refugee Day, the good news is that there is little that prevents President Trump and his administration from changing course and substantially improving U.S. practices. Toys left behind by children at border crossing in Greece. Examples of this commitment over many decades are varied. It appears in the Refugee Act of 1980, the bipartisan legislation overwhelming enacted by both houses of Congress, in which Congress declared that it is the “historic policy of the United States to respond to the urgent needs of persons subject to persecution in their homelands.” The U.S. commitment is also reflected in a strong and bipartisan willingness by the U.S. Congress to generously fund refugee and humanitarian assistance. Finally, the importance of international humanitarian leadership has been articulated by President Trump himself. At the United Nations General Assembly last year, the president proudly declared that “the United States continues to lead the world in humanitarian assistance,” noting efforts in South Sudan, Somalia, northern Nigeria, and Yemen, as well as on a range of health, gender, and human rights-related initiatives. These are most clearly reflected in U.S. accession (during the administration of Lyndon Baines Johnson) to the 1951 Convention Relating to the Status of Refugees and its 1967 Protocol, and include the prohibition against the return of any individual to a country where his or her "life or freedom would be threatened on account of his [or her] race, religion, nationality, or membership of a particular social group or political opinion. "(1) U.S. commitments are also reflected in the Refugee Act of 1980, which establishes an annual process for refugee admission to the United States. This process is in addition to U.S. asylum procedures, by which individuals already in the United States or seeking entry at U.S. borders are considered for asylum based on a credible fear of persecution in their home countries. In 1984, in justifying its decision to provide humanitarian aid to famine-affected Ethiopia, the Reagan administration declared that “a hungry child knows no politics.” Indeed, U.S. officials have long endorsed a commitment to ensure that lifesaving and life-sustaining humanitarian assistance should be based on humanitarian need, consistent with the principle of humanity (i.e., the belief that profound humanitarian suffering must be addressed wherever it is found). Under U.S. law, asylum is designed to provide protection for individuals fleeing persecution in their countries of origin and is a critically important safeguard against return to torture, imprisonment, and other mistreatment. Individuals already present in the United States may request asylum, and asylum may also be requested at ports of entry. Through the public demonization of asylum seekers and the incarceration and criminal prosecution of those fleeing persecution before their asylum claims are considered, the Trump administration has undermined this protection. As has been widely reported, the administration has adopted an initiative in which the U.S. government prosecutes all those who cross the U.S. border without authorization. This is resulting in the criminal prosecution of asylum seekers and imposition of criminal sentences prior to consideration of any claims for asylum. It is cruel and unnecessary to prosecute asylum seekers for crossing borders without authorization. Moreover, under Article 31 of the 1951 Convention Relating to the Status of Refugees, to which the United States is bound by its accession to the 1967 Refugee Protocol, parties “shall not impose penalties, on account of their illegal entry or presence, on refugees who, coming directly from a territory where their life or freedom was threatened…enter or are present in their territory without authorization, provided they present themselves without delay to the authorities and show good cause for their illegal entry or presence.” This provision is all the more important in light of recent reports that asylum seekers and their families are unable to promptly request asylum at ports of entry due to inadequate U.S. processing capacity at the border,(2) and the fact that asylum seekers and their families have to wait many days and nights in the border area in extraordinarily difficult conditions. Under such circumstances, those who make the decision to cross the border without authorization should be treated in accordance with – and within the spirit of – Article 31 of the Refugee Convention. In addition, through the criminal prosecution and incarceration of asylum seekers traveling with children, the Trump administration is implementing a policy of separation of children from their parents, which risks dramatic psychological and other negative consequences for the children and their families. (3) The policy appears designed as a deterrent to other would-be asylum seekers, and it is simply unconscionable to hold children hostage to this deterrence objective. The separation of families has appropriately been the subject of much public attention and concern, and it comes on top of a range of Trump administration measures that create unfair and unreasonable risks to asylum seekers and, in many cases, conflict with U.S. legal obligations. Finally, RI is deeply concerned by the Attorney General’s recent decision overturning a U.S. Board of Immigration Appeals (BIA) ruling on the status of a Salvadoran woman who suffered domestic violence in her homeland and sought refuge in the United States. (8) The decision will dramatically restrict asylum claims and thereby put at risk the lives of thousands of women who seek to escape domestic and gang violence. RI is also concerned that the Attorney General substituted his judgment for the considered view of the BIA, which has had considerable experience on the evolution of U.S. jurisprudence on this critical issue. As the United Nations Refugee Agency documented in a 2015 study, Women on the Run, “particular groups of women, such as police officers, women with children, and transgender women, face disproportionate levels of persecution.”(9) The Governments of Honduras, El Salvador, and Guatemala have repeatedly demonstrated an inability to protect their citizens from gang violence, and, in particular, an inability to protect women who are targets of both gang-related violence and domestic abuse. All three countries have rising rates of femicide. This was an unnecessary and unfortunate decision by the Attorney General. Since passage of the Refugee Act of 1980 by huge bipartisan majorities in both the Senate and the House, the United States has successfully resettled nearly three million refugees under the Refugee Admissions Program. Under this program, the president, after consultation with the Congress, annually determines how many refugees the United States will choose to resettle from countries of temporary refuge around the world. Other countries also resettle refugees as part of an international responsibility-sharing effort. Unfortunately, President Trump has continually articulated unmitigated hostility toward U.S. resettlement of refugees, foreshadowed by presidential campaign statements vilifying refugees and, in particular, new arrivals from Muslim countries. Several Trump administration actions between January 2017 and February 2018 promoted misconceptions about threats posed by refugees and dramatically reduced resettlement from Muslim majority countries. These measures included two presidential executive orders in January and March 2017, which suspended the U.S. Refugee Admissions Program, a further Trump administration review of the program announced in October 2017, and new and restrictive procedures put in place in February 2018. Notwithstanding the Trump administration’s misleading statements about the program, the social and economic benefits of the U.S. resettlement of refugees are well documented,(10) and the purported threats posed by refugees are wildly exaggerated. (11) In fact, there have been some one million refugees resettled in the United States since 9/11. Over that time, there have been many thousands of violent incidents resulting in the death of Americans. In not one of those cases, however, has a resettled refugee been responsible for an act of violence resulting in an American death. Nonetheless, for 2017, President Trump indicated the United States would resettle no more than 45,000 refugees, the lowest ceiling since the program began in 1980 and despite the record number of refugees worldwide. In fact, the U.S. government is on track to resettle less than 25,000 refugees in 2018, the lowest number of resettled refugees in the history of the program. Under U.S. law, Temporary Protected Status (TPS) provides humanitarian protection in the United States to foreign nationals from designated countries who are unable to return home due to conflict, natural disasters, or other extraordinary conditions. RI has studied planned revocations involving El Salvadorans, Hondurans, and Haitians, who together make up the vast majority of those for whom TPS status will be discontinued. In making its determinations about these populations, the Trump administration did not take adequate account of critical humanitarian factors. These are countries that are not only prone to recurrent, acute disasters like earthquakes and hurricanes, but also suffer from chronic political instability and rampant corruption and are plagued by extremely high levels of violence, including against women and children. El Salvador and Honduras have some of the highest homicide rates in the world due to criminal gangs. In the case of El Salvador, where there are extraordinarily limited protection options for those being deported from the United States, the return of nearly 200,000 TPS beneficiaries risks a human rights and humanitarian disaster. In addition, beneficiaries from El Salvador and Honduras have been living in the United States as law abiding citizens for nearly two decades; their returns will impose unnecessary risks to them and to their families. Finally, some 270,000 American children have parents from El Salvador, Honduras, and Haiti who are TPS holders and who now face deportation. Many of these families will be torn apart or the parents will be forced into undocumented status. The Trump administration has sought to dramatically slash U.S. lifesaving financial assistance to those around the world experiencing humanitarian crises, notwithstanding that such funding constitutes far less than one percent of the federal budget. President Trump has also unreasonably denied lifesaving humanitarian assistance to vulnerable communities around the world, and has failed to assume a strong leadership role in humanitarian crisis prevention and response. Rohingya children in Bangladesh carrying food aid. Seeking to cut lifesaving assistance: Unveiled in early 2017, the Trump administration’s 2018 budget proposals called for unprecedented cuts to international humanitarian funding for food, shelter, and related needs, as well as global health, maternal/child health, and international peacekeeping measures. The proposed cuts of about 30 percent would have dramatically reduced U.S. food aid, “zeroed out” a critical refugee emergency fund, eliminated a key fund used to support programs like UNICEF, and significantly reduced contributions to peacekeeping activities. Congress, with bipartisan support, soundly rejected these cuts, and President Trump ultimately signed the legislation that provided significant humanitarian funding. Nonetheless, the Trump administration unveiled in February 2018 proposals for dramatic cuts in fiscal year 2019 funding relating to refugee and emergency refugee assistance, disaster assistance, food aid, global health programs, and international programs that fund activities such as UNICEF. Denying lifesaving assistance to vulnerable communities: In 1984, in justifying its decision to provide humanitarian aid to famine-affected Ethiopia, the Reagan administration declared that “a hungry child knows no politics.” This sentiment – although implemented imperfectly by U.S. administrations over the years – has nonetheless guided U.S. policymakers, and the United States has endorsed the objective that assistance to vulnerable populations should be “solely on the basis of need, without discrimination between or within affected populations. "(13) Yet over the past year, senior U.S. officials, including U.S. Ambassador to the UN Nikki Haley and President Trump himself, have threatened to hold humanitarian aid hostage to political support from leaders of vulnerable populations in need. Earlier this year, the Trump administration withheld $65 million of the planned U.S. contribution to the UN Relief and Works Agency for Palestine Refugees (UNRWA) because the administration opposed positions espoused by the Palestinian political leadership. (14) The withdrawal of support is having tangible humanitarian consequences for life-sustaining assistance to children, women, and men in Jordan, Lebanon, Syria, and the West Bank and Gaza Strip. Whether it is emergency food aid, access to primary healthcare, access to primary education, or other critical support, these consequences will become increasingly dire if the cuts are made permanent. Failure of Presidential Leadership in Humanitarian Crisis Prevention and Response: The humanitarian crises currently causing the greatest suffering may be those originating in Myanmar, Syria, and Yemen. President Trump is responsible for none of them, but presidential leadership is critical to efforts to mitigate future suffering. To date, the president’s actions – and failure to act – have been extremely damaging to vulnerable populations in these countries. But President Trump himself has been silent on the horrendous atrocities committed by the Government of Myanmar. The absence of presidential leadership undermines any international effort to convince Myanmar to create conditions that may ultimately permit return in safety and dignity. Any precipitous U.S. disengagement will put at risk the well-being of hundreds of thousands of Syrians. (17) While funding for the White Helmets, a critically important humanitarian non-governmental organization (NGO) operating in Syria, was recently released, additional money to support the progress made in northeast Syria remains frozen. In Yemen, over a quarter of the population is at risk of starvation. Some 16 million or more Yemenis lack access to water, sanitation, and healthcare. In December 2017, President Trump publicly urged the Saudis to permit humanitarian access. However, the Trump administration has failed to check military operations by the Saudi-led coalition, which continue to exacerbate the suffering, and President Trump does not appear to have sustained strong engagement on this humanitarian issue. At this writing, an assault on the Yemeni port of Hodeida appeared underway and was expected to result in enormous additional humanitarian misery for the civilian population. 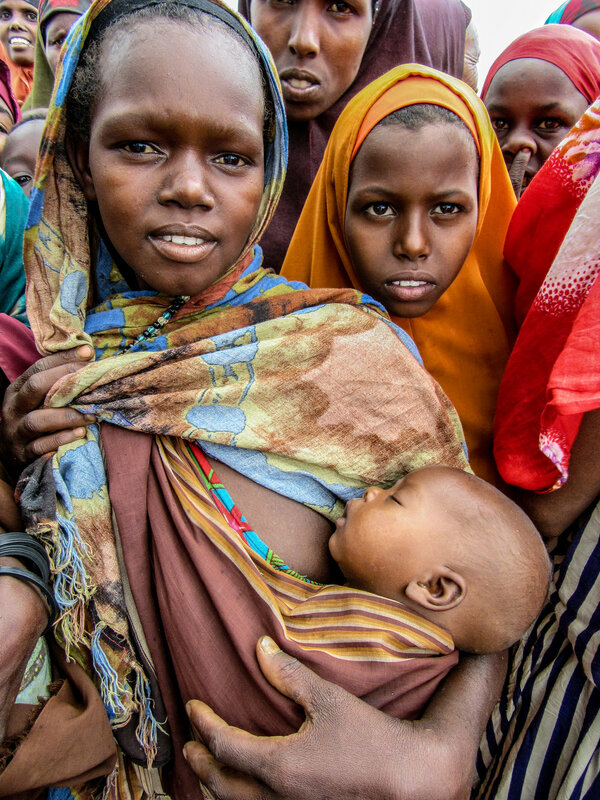 Women and children displaced by drought conditions in Somalia. The State Department announced an exception to this prohibition involving humanitarian and disaster-related accounts, which is why RI has awarded the Trump administration a D rather than a failing grade. But much non-emergency funding, which has been impacted by the prohibition, builds resilience for women and girls who may find themselves in humanitarian emergencies. In a separate action, the United States withheld funding from the UN Fund for Population Activities (UNFPA), the lead UN agency for ensuring that women and girls who have fled conflict obtain access to critical sexual and reproductive health services, as well as the services relating to prevention and response to gender-based violence. Funding from the United States to the UNFPA, which had included funding for humanitarian and disaster response, has been eliminated completely. Trump administration action will directly impact the abilities of the U.S. government, and the capacity of UNFPA and other aid agencies, to provide women and girls with critical sexual and reproductive assistance in the context of disasters and in rehabilitation programs. The United States and other governments of the world have recognized the crucial importance of working closely and cooperatively on international migration issues – which impact humanitarian concerns – whether that includes counter-trafficking initiatives, anti-smuggling efforts, measures to aid migrants who are victims of criminal activities, or related measures. Nonetheless, in early December 2017, the United States announced its withdrawal from negotiations for a UN Global Compact on Safe, Regular, and Orderly Migration (GCM), an arrangement among governments to establish common principles and approaches to deal with the growing challenges of international migration. The GCM was envisioned in a 2016 intergovernmental New York Declaration for Refugees and Migrants, of which the United States was a part. U.S. engagement has made great sense, as there are some 250 million people living outside their countries of origin,(22) and the United States is host to the largest number of migrants in the world. In withdrawing from the diplomatic discussions around the proposed GCM, the United States has abdicated responsibility for an important document that will play a key role in developing programs of cooperation between governments, common approaches on provision of assistance, and measures to combat discrimination, among other initiatives. While withdrawing from the world’s most important international migration discussion, the Trump administration has pressed to secure the election of its nominated candidate, Ken Isaacs, to the position of Director General of the world’s most important migration agency, the International Organization for Migration (IOM). Beyond the awkwardness of this U.S. advocacy in light of U.S. withdrawal from the GCM negotiations, the U.S. nominee has an unfortunate record of prejudiced comments against Islam, contending that the religion is not peaceful and is linked to terror. Especially given IOM’s work in Muslim-majority countries, this nomination is not appropriate, and the candidate should not be elected. For all these reasons, the Trump administration merits a failing grade on leadership relating to international migration issues. 1. United Nations Refugee Agency (UNHCR), “Convention and Protocol Relating to the Status of Refugees,” 1967, 30, http://www.unhcr.org/en-us/3b66c2aa10. 2. Simon Romero and Miriam Jordan, “On the Border, a Discouraging New Message for Asylum Seekers: Wait,” New York Times, June 12, 2018, https://www.nytimes.com/2018/06/12/us/asylum-seekers-mexico-border.html. 4. Department of Homeland Security, “U.S. Citizenship and Immigration Services Memorandum: Release of Updated Asylum Division Officer Training Course (ADOTC) Lesson Plans, Credible Fear of Persecution and Torture Determinations, and Reasonable Fear of Persecution and Torture Determinations,” February 13, 2017, http://www.aila.org/infonet/uscis-asylum-division-memo-releasing-revised. 5. Tal Kopan, “Trump admin quietly made asylum more difficult in the US,” CNN, March 8, 2017, https://www.cnn.com/2017/03/08/politics/trump-immigration-crackdown-asylum/index.html. 6. B. Shaw Drake, Eleanor Acer, and Olga Byrne, “Crossing the Line: U.S. Border Agents Illegally Reject Asylum Seekers,” Human Rights First, May 2017, 1, http://www.humanrightsfirst.org/sites/default/files/hrf-crossing-the-line-report.pdf. 7. “New Report Documents U.S. Border Agents Illegally Turning Away Asylum Seekers at U.S. Border,” Human Rights First, May 3, 2017, https://www.humanrightsfirst.org/press-release/new-report-documents-us-border-agents-illegally-turning-away-asylum-seekers-us-border. 8. Katie Benner and Caitlin Dickerson, “Sessions Says Domestic and Gang Violence are not Ground for Asylum,” New York Times, June 11, 2018, https://www.nytimes.com/2018/06/11/us/politics/sessions-domestic-violence-asylum.html. 9. United Nations Refugee Agency (UNHCR), “Women on the Run: First-hand Accounts of Refugees Fleeing El Salvador, Guatemala, Honduras, and Mexico,” 2015, 12, http://www.unhcr.org/en-us/publications/operations/5630f24c6/women-run.html. 10. Hamutal Bernstein and Nicole DuBois, “Bringing Evidence to the Refugee Integration Debate,” Urban Institute, Immigration and Immigrants Department, April 2018, https://www.urban.org/sites/default/files/publication/97771/bringing_evidence_to_the_refugee_integration_debate_0.pdf. 11. Alex Nowrasteh, “Terrorism and Immigration: A Risk Analysis,” CATO Institute, Policy Analysis No. 798, September 13, 2016, https://www.cato.org/publications/policy-analysis/terrorism-immigration-risk-analysis. 12. For a listing of countries under TPS designation, including those whose designation is expected to end, see USCIS, “Temporary Protected Status,” https://www.uscis.gov/humanitarian/temporary-protected-status. 13. This commitment is reflected in the “Good Humanitarian Donorship Principles,” first accepted by the Administration of George W. Bush, which helped establish the intergovernmental Good Humanitarian Donorship Initiative, https://www.ghdinitiative.org/ghd/gns/principles-good-practice-of-ghd/principles-good-practice-ghd.html. 14. Noa Landau and Amir Tibon, “Nikki Haley: U.S. to Withhold Funding for UN Agency for Palestinian Refugees Until They Join Peace Process,” Haaretz, January 2, 2018, https://www.haaretz.com/us-news/haley-u-s-to-withhold-unrwa-funding-until-palestinians-join-peace-talks-1.5630281; and Arshad Mohammed, “U.S. withholds $65 million in Palestinian aid after Trump threat,” Reuters, January 16, 2018, https://www.reuters.com/article/us-israel-palestinians-usa/u-s-withholds-65-million-in-palestinian-aid-after-trump-threat-idUSKBN1F52GA. 15. United Nations Security Council Chamber Remarks, “Remarks by the Vice President to the UN Security Council,” September 20, 2017, https://www.whitehouse.gov/briefings-statements/remarks-vice-president-un-security-council/. 16. Margaret Talev and Daniel Flatley, “Trump Says He Wants U.S. Troops to Leave Syria Soon,” Bloomberg, April 3, 2018, https://www.bloomberg.com/news/articles/2018-04-03/trump-says-he-wants-u-s-troops-to-get-out-of-syria-soon. 17. Daryl Grisgraber and Hardin Lang, “Fragile Progress: Humanitarian Assistance and the Stabilization of Northeast Syria,” Refugees International, June 2018, https://www.refugeesinternational.org/reports/progressinnortheastsyria. 18. For more on this policy and its impact on women’s health, see the Center for Health and Gender Equity’s May 2017 Policy Brief, the Impact of Trump’s Global Gag Rule Women’s Health, http://iawg.net/wp-content/uploads/2017/09/GGR_Fact_Sheet_UPDATED_May_2017-003.pdf. 19. Pramila Patten, UN Special Representative of the Secretary General on Sexual Violence in Conflict, in a press conference held in Cox’s Bazaar in November 2017, as cited by Serajul Quadir, “UN official says will raise sexual violence against Rohingya with ICC,” Reuters, November 12, 2017, https://af.reuters.com/article/worldNews/idAFKBN1DC0MW. 20. UNHCR, “Uganda: Emergency Update on the South Sudan Refugee Situation, 23rd-29th November 2016” Inter-Agency Weekly, November 2016, https://reliefweb.int/sites/reliefweb.int/files/resources/Uganda%20Operational%20Update%20on%20the%20South%20Sudan%20Emergency%20Response%2023-29%20November%202016.pdf. 21. Samuel Okiror, “For victims of the Ituri conflict’s sexual violence, aid is scarce,” IRIN, March 20, 2018, https://www.irinnews.org/feature/2018/03/20/victims-ituri-conflict-s-sexual-violence-aid-scarce. 22. United Nations, Department of Economic and Social Affairs, Population Division “International Migration Report 2017: Highlights,” 2017, http://www.un.org/en/development/desa/population/migration/publications/migrationreport/docs/MigrationReport2017_Highlights.pdf.